Simon Says Make it Sparkle! We would like to wish you all a Very Merry Christmas and Best Wishes for a Happy and Prosperous 2017! This week we are showcasing Hero Arts Products. You don’t have to use them for the challenge but if you have them we would love to see them used. I used the beautiful Floral Border with Frame die from Hero Arts along with Flowing Vine Collage die from Simon Says Stamp to create a card. These two dies layer beautifully and go with each other. 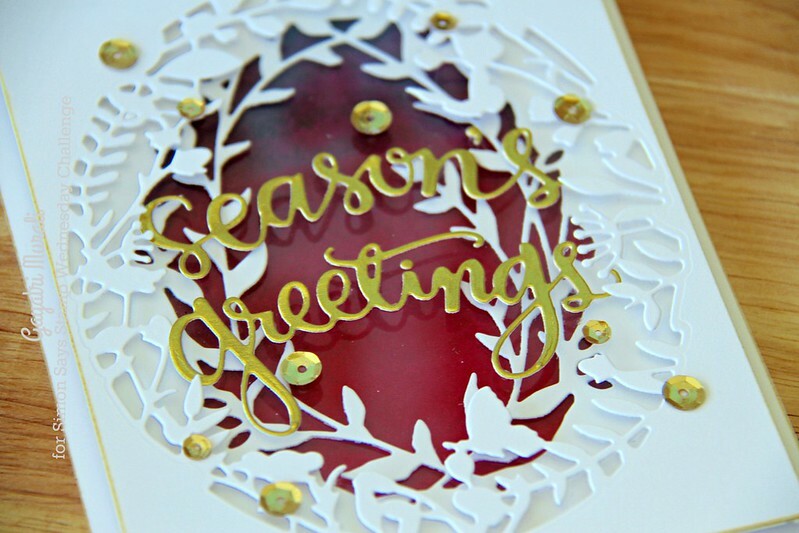 I die cut two white panels using the second and third rectangle die from Hero Arts infinity rectangle die set. Then on the largest panel I used Hero Arts Floral Border die to die cut and the SSS Flowing Vine Collage die on the second panel. I added acetate sheet behind both the panels and layered the panel using foam adhesives to add dimension. I brushed gold pigment ink on edges of top panel. For the background, I watercoloured rich purple to red watercolour on watercolour paper. I left it to air dry then trimmed the panel and added to the layered panels using foam adhesives. I adhered the completed panels to the white card base which is also brushed with gold pigment ink on the edges. 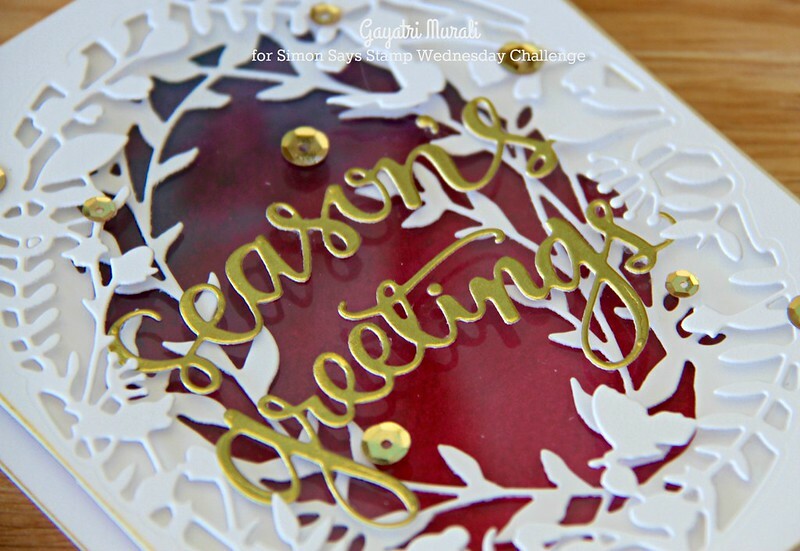 For the sentiment I die cut Season’s Greetings using SSS Season’s Greetings die and gold mirror cardstock. I adhered the sentiment flush on the centre of the card front. Then embellished with gold sequins from Pretty Pink Posh. What a pretty mix, Gayatri, crisp as winter! Your gold touches make it so elegant! Stunning design, Gayatri! Love how you layered the frames! Those layers of white against that gorgeous background are just fabulous!